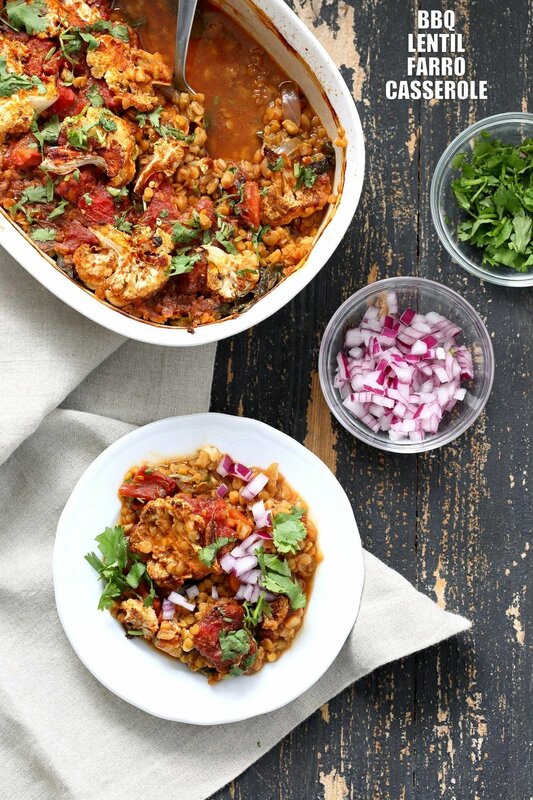 The post Barbecue Lentil Farro Cauliflower Bake – BBQ Casserole appeared first on Vegan Richa. Oh hey its Sunday! Although it should be getting warm and springy, we still have some cloudy and showery days. And this Casserole fits in just right. It is warm, hearty and filling and uses bbq sauce and herbs to remind us of the warm summers to come. This casserole comes together very quickly and makes an amazing filling meal. Just layer the veggies, spinach, lentils, farro. Then sprinkle in the spices. Layer the cauliflower on top, add water/broth and bake. Just a few minutes active time to assemble, then wait for the bake. This is easily made gluten-free with steel cut oats, rice, quinoa or millet.